It’s a good question. The average Halloween Season for me is about 50 days long. I average 43 articles in that time around a day job and family and diving head first into the leaf pile that is Autumn. And every hour I spend writing is an hour less I spend watching a horror movie. Or hanging out at a Fall festival. Or just gazing at my pumpkin with adulterous eyes. Every photo we take is a moment outside the moment. Plus, I run an experiential blog. I’ve got to do stuff. 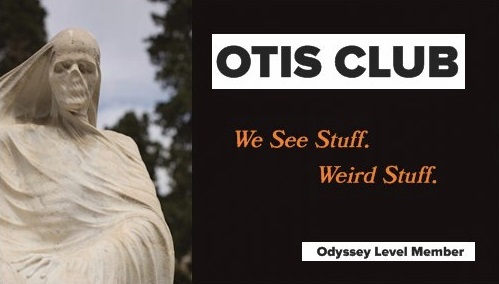 See stuff. Visit stuff. The Halloween Season is an active one for me. So, to make sure it’s more active and less busy, I prep in advance. The entire month of August is dedicated to writing evergreen Halloween articles. And by evergreen, I mean the types of articles that would work in any Halloween Season, regardless of the unique character of that particular Halloween Season: Oddity visits to spooky sites that I’ve already visited, personal anecdotes from my past, regular old article ideas. I use these throughout the season so that I don’t have to write every day. That screwdriver is relevant to later in the Season. Stay tuned. But I do still write every day. That’s true regardless of the season. I’m a writer. That and weird B.O. are like my two defining qualities. I write, of necessity, late at night. Somewhere between the hours of 10 and 1 or whenever I’m too tipsy to keep going. So I’m not missing family time or staying at home on a Saturday afternoon when I should be lost in a corn maze or traipsing through Spirit Halloween. Sleep is my sacrifice. I do miss my nightmares, though. Plus, writing inspires me to do more Halloween. Sometimes, when I think I’d rather not get out of bed or off the couch for some activity or oddity somewhere, knowing it’ll be a cool article will be enough to get me upright when the activity itself isn’t quite up to the often insurmountable challenge that is my own laziness. It also pushes me to have a varied season, when part of me just wants to only watch horror movies every night while shoveling Halloween-themed candy into my mouth. As to photos, we would be taking those like crazy even if they were never posted anywhere. We just like taking photos. But everything I’ve told you so far is preamble. 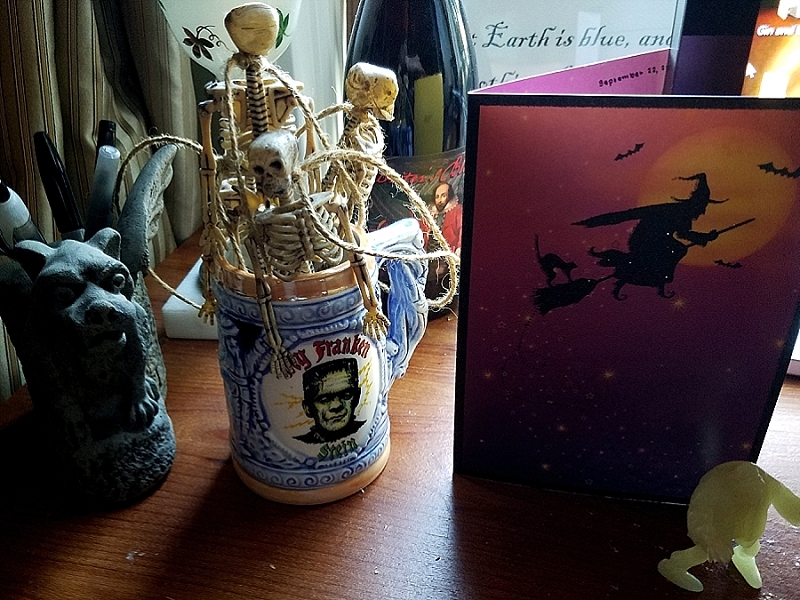 The real truth is that writing for me is a Halloween activity…thanks to my desk. 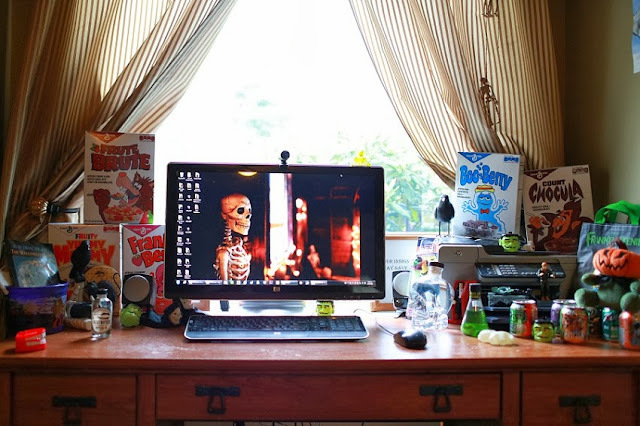 While I’m writing away at midnight, a pumpkin-scented candle burns at my elbow, monsters peek around the edge of the monitors, candy and books and toys crowd around the keyboard and stare at the screen to see what I’m typing. I write about Halloween while I’m surrounded by Halloween. 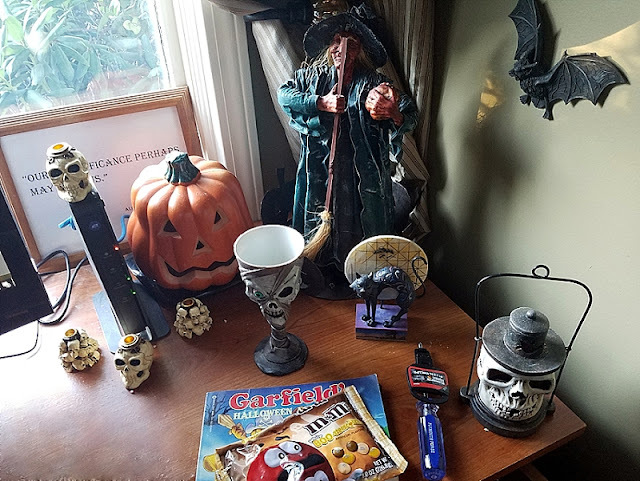 Sure, I call the barn attic Halloween HQ, and my living room is really where the cauldron magic happens. But the third Halloween spot in my house is my desk. It’s in a little nook in my study and faces a big picture window, where I gaze out on the neighborhood and wish my life here was more like The ‘Burbs. 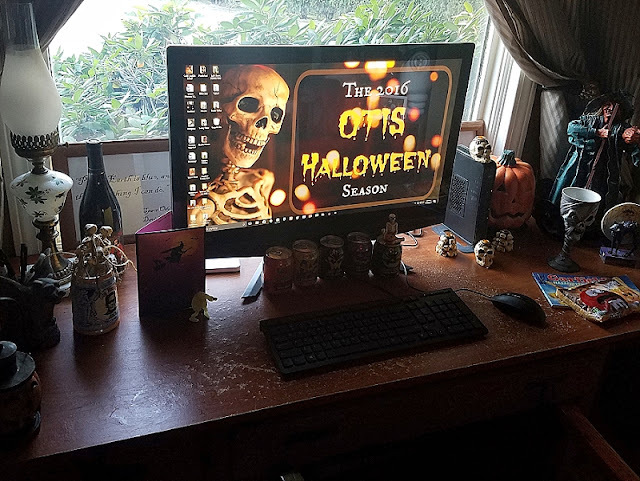 My Halloween Desk from three years ago. On the desk, it’s like the land of misfit Halloween things. The decorations are all cracked or have irreplaceable burnt-out bulbs (so they don’t end up in the living room), there’s food that we’d never eat (so it doesn’t end up in the kitchen), or random Halloween things I don’t know what to do with, but can’t bring myself to throw away (so they don’t end up in the trash). And then, of course, there’s Mary. It all funnels to my desk where I stake out just enough clean space for my keyboard and mouse. It’s like a little Halloween fort in that way. And I like hiding in it. So don’t feel bad for me that I have to write my Halloween Season away. Feel bad for me because I never developed the ability to write and listen to music at the same time. There’s no Whodini’s Haunted House of Rock for me in my cozy little Halloween fort.